This week was awesome. Our prayers were answered and we saw many hearts change. Last night I said some things on the tape I'm making so I'll just touch on a couple things in the e-mail. We did have the baptism! Donald was baptised by Elder Eldredge and I confirmed him on Sunday, yesterday. It was the first baptism for the both of us and it went good. We also got to go to the Nauvoo Temple on Saturday and we got to go through the temple with Brother Tingley (our branch mission leader) and his wife for their first time then got to see them sealed. I had never been to a sealing so it was awesome. We did not even tell him we were going to be there, but we were able to pull some strings and showed up, and he was so happy to see us there with him. At the last zone conference, our mission president told all the missionaries that with the mission closing in a few months, there would be no more temple trips. We totally forgot that, so we called the President and asked if we could go. He said there were no more Temple trips, but we were working hard and deserved it, so he let us go if we didn't tell anyone. There is a picture of Brother Tingley and his wife, and also a picture of Elder Eldredge and I with our branch President, President Nickles. It has been a very spiritual week. We have been specific in our prayers, to be able to find a family that knows a family in the Clinton branch and be able to teach them. On Thursday morning we got a call from a member that wanted us to go over to her friend's house to give her a blessing. She is a non-member and so went over to give her one. When we were done she started asking about very deep questions about life and that kind of thing. We taught her the first lesson and both of us bore a very powerful testimony and committed her to be baptised. She said yes and wants her family to be baptized as well. So our prayers were answered that very day. We found and taught a family that knew a family in the Clinton branch. Our investigators have made huge progress this week. Last week an investigator of ours was scared to pray and did not think he was worthy to pray. This week we came by for the appointment and he started telling us that he had been praying and wanted to be baptised! Another investigator we have is Catherine and Eric. Catherine has been sick for a few weeks and so we haven't seen her for a while. Her boyfriend Eric, did not like us at all. He wouldn't answer the door when we knocked and would always blow off our appointments. So we were about to drop them but thought we should try their door one more time. They let us in and Eric started talking about the Book of Mormon. We got into a huge discussion about it (which had never happened before) and then he said, "You know, I usually don't like people coming into my house and teaching me about this kind of thing, but you two, I like you, you are welcome here any time". I have never seen so many prayers answered and so many miracles come about. The Lord has really helped us out this week and is blessing the people here in Clinton. Ok I don't think that I need my savings account. There shouldn't be any money in it anyway, so if they are charging me every month, just close it for me if you can. Thank you so much for the package you sent this week. I wanted to have a pocket Book of Mormon for tracting and that sort on thing. People get intimidated when they see a guys like us with a Bible looking thing in our hand, so it's nice to be able to put that in your suit pocket. I wanted 2 of them so I could give the other to Elder Eldredge for his birthday. It's this Saturday. We had a party last night for him (just Eldredge and I). A while back you sent me some glow sticks, so we put them to use last night. Donald is going to be baptized this week on Thursday the 25th. We had to move the date up a couple of days due to the branch temple day on Saturday. We are excited for him and he wanted Elder Eldredge to baptize and me to confirm. Laisha came to church for the second time yesterday and stayed for all three hours! That's a first. Believe it or not, Laisha signed up to feed us dinner this Saturday night! Our investigator it feeding us! How often does that happen? We're not really sure what we are going to teach her while we are there but I'm sure we'll think of something. Family, this week is POWER WEEK! Which is a week we are doubling our efforts to reach our goal of 220 baptisms for the mission by July 1st. Our district set this as a goal this transfer. We are going to have 2 power weeks, this week and another 3 weeks from now. We set some very high goals, are doubling our prayers, cut back on lunch time, and are praying for inspiration this week to help find those people who are prepared by God to hear our message. Its going to be a long hard week so please keep Elder Eldredge and I in your prayers. Every thing is going great, family. Thank you for the pictures, I always put the new ones you send on my desk. Melanie, you looked great with the whole 80's get-up goin' on. I cant believe you're already planting in the garden. Roxanne, I just put your letter in the mail this morning, so you will be getting one pretty soon. Rachel keep it up in school and stay focused. It's so easy to get overwhelmed but of any one that can do it, you're the one. Dad, I love getting your letters and to hear about daily life in the Hale clan. I miss you all and can't wait to hear from you. Ok, so I know I've been holding out on letters, but we've been so busy with the work, but that's no excuse so here's a letter that should make up for all of them. So, Dad, you got a bell? Is that right, like the one at Grandpa's house? That sounds sweet! How far along is the attic coming? I want to see some pictures of it when it's all done. It sound like Phoenix has had a ton of rain since I've been gone. I love it when it rains in the desert, enjoy the greenery and that smell of wet desert, I love that smell. The snow here is almost gone, just little bits left here and there. This week I've finally seen grass. I forgot what that looks like. People in the branch are excited. They said from the beginning of December until now Iowa has received the most continuous snow. So we are all happy to see the snow melt and see green once again. It's been in the 30's and 40's. It's been so nice, we just wear the suit coats when we're out and it feels great. Sounds like the Pioneer handcart thing will be fun. I wish they could have done that when I was a youth. I didn't know how bad the earthquake was in Chile for a long time, but it was an 8.8 and lasted 2-3 minutes. That is so wild. I'm glad Elder Orozco is ok. We had a member print us off an account of the mission president's wife in the area of Chile that got hit the hardest. She actually was inspired in the night that there was going to be an earthquake. I sent it with this letter. You'll have to read it. It's really interesting. Mother, tell Shannon that I write everyone back, but especially her. I'm sorry to hear about Michael. I hope he's getting better. Aunt Lauri wrote me a letter a week or two ago and I was about to write her back, then I heard about Michael. I'm glad I waited to write so I can write something to help her out. Thank you for the package and the birthday stuff for Elder Eldredge. He has received 2 pieces of mail since I've been here with him and he's always checking the mail, but it's always for me, so it kind of makes me feel bad. But the birthday stuff was great. I'm going to throw him a big 21st birthday. He doesn't believe me, but I will. Right now he's making me blueberry pancakes which I really haven't had since I was home. He's such a great guy. I actually met a duck the other day. We were in South Clinton and it's separated by the train tracks, so we come out from the tunnel to south Clinton and Eldredge asks me which way to go. I look over and see a duck. At first I thought it was a little statue sitting on the porch (because everyone in the Midwest does, I don't know why) so we head that way and as we got closer, the duck starts to move. It was a super nice duck! I named him Harold and started petting him. 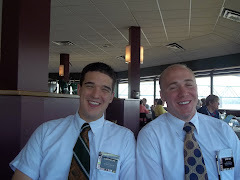 I have some sweet pictures of him and Elder Eldredge getting along that I will send the next time I do pictures. The other week was great because we got approached by a man named Larry. We were out walking down the main street of town looking for people to talk to. I told Elder Eldredge that we should take a side street that went off the main road. We walked for a couple blocks and saw a truck on the other side of the street with someone sitting in it while it was idling there. We both looked at it and thought nothing of it. We walked about 100 ft down the road and the man in the truck got out and was running after us asking if we were the "mormons". We said we were and he said that he had been taught by the missionaries, but then moved suddenly and lost contact. Without hesitation, he asked us "will you come teach me?" We both looked at him funny and were like "YES!" We got his info and headed off. We set up an appointment a few days later and headed over. We were on splits that night so it was just me and a member of the branch over to teach him for the first time. I always get nervous every time on splits cuz the member just sits there and looks at me. And then I feel like I just ramble the whole time. So I teach him the whole lesson and kind of talk a bit about prayer at the end. He tells me about what happened to him that night when we met. He said that since he moved, he had been praying about religions and that kind of thing. He had been waiting for someone to knock on his door, but no one did. So when he saw us that night, he wasn't going to come talk to us, but then something told him that maybe he needed to come find us, instead of us finding him. I told him that we had been inspired that night to walk down that street and he found that real interesting. I don't have too many adventures here in Iowa, but I try to keep it interesting. Last week I was kind of in a low spot. I was really sick on Tuesday so we stayed inside all day. We had p-day before (on Monday) so that I felt like we had almost gone 2 days without doing much missionary work. It also seemed like the MTC spiritual high had been wearing off, so it felt like I was missing that new missionary drive. I kind of got down on myself Sunday night thinking about the week and then suddenly thought to read my patriarchal blessing. I read that and it has put in a new sense of determination into me. The next morning I was reading in 3 Nephi when Christ was teaching the people and talking about the last day (3 Nephi 21:26-20). It's all about missionary work and the last days when the missionary work will go abroad. In verse 29 it basically says "for I will go before them . . . and I will be their rearward" It just let me know that Christ has my back as I go out and do his work. I just need to bear that in mind and stop worrying about what I think, whenever I doubt I can always turn and find him there to help me. That's the hard part though, stop worrying about what I think and just keep doing the work. Every time I do work and talk to people I feel great, no matter what mood I'm in. If I just start talking to people and teaching them, I don't know what it is, I just forget my concerns and automatically feel great. I truly love being a missionary and going around talking to people and even being rejected. Elder Eldredge and I have so much fun serving together, it's going to be a tough day when we have to part, but change is great. Change is the only thing to help individuals progress. As much as I don't like change, to step outside of my bounds, I always see that it makes me better over all and pushes me to grow. Sorry I don't have the best stories, or am able to explain them as much as I could, but I hope you like them. The members in the branch are so wonderful, they support us as much as they can and feed us soooo well when we are invited over. 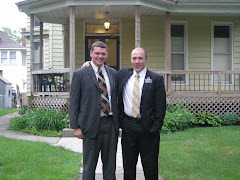 I have much more understanding of the missionary/member relationship and roles in the church. I'm loving life and am pushing for baptisms. 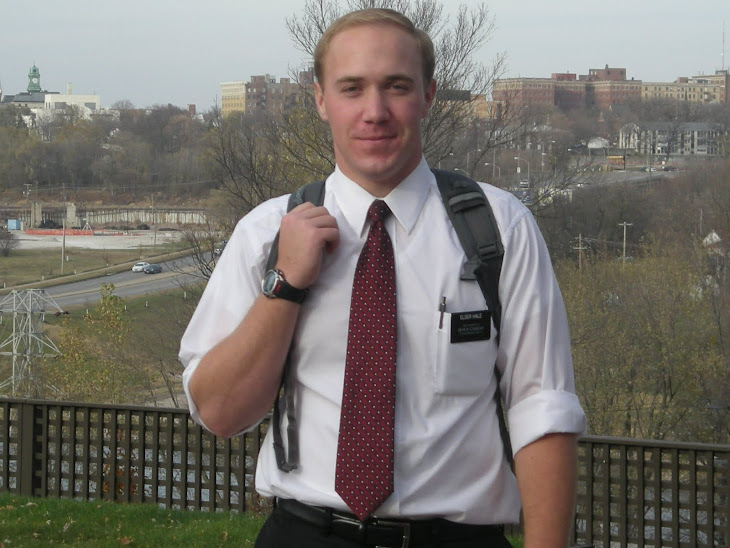 I just received a letter from Elder (Jacob) Thompson today so we are in contact. I know you were wondering. I hope you can read my handwriting and my misspellings. LOVE YOU ALL and can't wait to hear from you. Well, yesterday I sent off a long letter home so you will receive that in the next couple days. I know you have been hurting for mail so I put 3 stamps on it to hopefully speed up the process. This week has been real eventful. We received a car on Friday and are now scooting around all over the Clinton metropolitan area. Its so crazy because we are able to go and visit all of our investigators in a afternoon rather than a week or so, so we are doing much more finding. We were tracting down a street we had never been down before and came across a very funny woman. It was a green house with a green door. I knocked and an old woman opened the door with a lock still on it so it was only a couple inches open. She said she was blind and did not let strangers in. She then asked who we were. 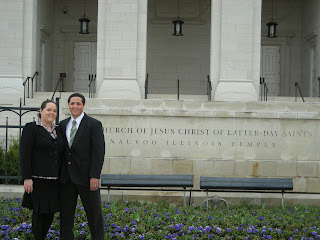 I said that we were missionaries from the Church of Jesus Christ of Latter-Day Saints. The door closed, we heard the lock come undone, and then the door flew open and standing there in all of her glory stood Virgina Barns. A woman said to be 102 years old (which I did not question) and she said that she loved missionaries from our church and invited us in, but she was the only one there so we had to refuse. We talked for a bit on the porch and then said facing me that she was in love with my voice and asked if I was blond. I said yes and she gave out a cat purr. It was so weird yet funny at the same time. She just kept telling jokes and cracking us up. So now I have a 102 woman that has a crush on me, she was the highlight of my Saturday. We still are on track with Donald, he came to church again yesterday. We are so excited for his baptism. I LOVE YOU ALL and hope you have a great week. I just finished off another tape so I'll try to get that out soon. Oh mom, could you do me a favor and send me 2 of the pocket Book of Mormon, and 2 pocket Bibles if they have them there at the book store or the distribution center. If they don't have the bibles don't worry about it. Thanks you and LOVE you very much! This week has been rough. Tuesday I was really sick. I ate something bad the day before and couldn't keep anything down. I thought it was the stomach flu going around here, but luckily it was just a one day thing. This week was the last week of our transfer and I had the feeling that Elder Eldredge was going to leave me and I would stay, but not the case. Elder Eldredge got called to be the new district leader! Which is sweet because now I get to answer the phone and say, "Hello, This is Elder Hale, assistant to District Leader Eldredge.."
Which means I do nothing, I just like to say that. Yesterday we had our first investigators come to church. It was our first investigators and their first time coming to church. It was so cool, Donald and Laisha both came. It was a really good fast and testimony meeting and then when it ended, Donald got up and turned to us and said, "I don't know what it was, a muscle twitch or something, but I felt something during that" It was so great to be able to tell him what that was and what the spirit was telling him. He's real excited to be baptized and we are on track for March 27th with him. Laisha had her one and a half year old with her and could not even concentrate during the whole thing cuz he was just out of control, but luckily I had this little action figure (I named him Ted) in my pocket that I found the week before doing service and had kept him in my suit pocket. I gave it to him and it calmed him down quite a bit. This town has exploded and we are so busy we can barely make time for all of our investigators. Well, I received your package today, thanks for the tie rack and the letters. It has been great to hear from you this week. I really liked the letter from grandpa about tracking without purse or script. I was telling Elder Eldredge about it when we went out tracting that day, and we just couldn't believe doing something like that today, no one would feed us. It would be a mission just to stay alive. Its hard to hear about Kelsey's companion, that would bug the heck out of me. I'm not even sure what I would do besides drag them around to do the work. Dad, it sounds like you're busy as always, with work and choir. I miss not being able to go to your performances, and those busy nights around the house. Melanie, so you didn't get accepted, that's ok, I don't know how mom could handle 2 children living far from home. Roxy, I'm trying to find some time to write back, so hold on. Rachel, hope things are going good for you with your packed school schedule and what not. Mom, I glad you liked the tape so much, I actually started another one last night with a jingle about Clinton, you'll like it. This week Elder Eldredge and I went on splits for a day in town. We got so much done with 4 elders and a car. One lesson we had was with a progressing investigator, we had our third lesson with her and she totally felt the spirit there. She didn't want to admit it but she started tearing up towards the end of the lesson. She told us she is going to come to church this week, so I'm excited. There is another investigator we talked to this week. He's been going through a rough divorce and has been very busy. He started to tell us everything that was going on when a thought came to my mind about when dad told me that in times of trouble, run towards the Lord and not away from Him. I could tell that touched him hard and he agreed to pray about being baptised. There was a little up and down this week but the lessons have really been coming easier to me now. It seems I've learned so much this week. Well, that's all I have time for but there will be a lot of answers to your questions on the tape I'm making.